Steve Milloy & I go over the score at a recent World House Choir rehearsal. me that he’d been commissioned by a group of five LGBTQ choirs to write a major work about Bayard Rustin — a gay, African-American, Quaker, civil rights activist. Little is known about Rustin who not only mentored Martin Luther King, Jr. but also pioneered the use of non-violent civil disobedience in the American Civil Rights Movement. As I sat in Steve’s living room in Cincinnati and listened to a draft of the first movement, I was immediately intrigued. I knew I wanted to perform this work as soon as I could get the forces together. Now I’m excited and full of curiosity as I read and learn more about Bayard Rustin. When the World House Choir rehearses Steve Milloy’s powerful narrated song cycle, Bayard Rustin, The Man Behind the Dream, I am buoyed and inspired to act, to connect, to change the current narrative. 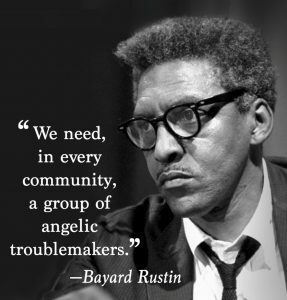 Though Rustin was born in 1912 and died in 1987, he is a man for these times, a model in every way for today’s activism. We so need Milloy’s rousing work of justice art right now. Hate wounds a loving heart. What will it take to move you to march? When all people stand together, we will know equality. What excites me about breathing life into this work? I am intrigued by how much this music brings Bayard Rustin’s life into focus and creates a blueprint for action today. The musicians gathered look like the world Bayard wanted to see. 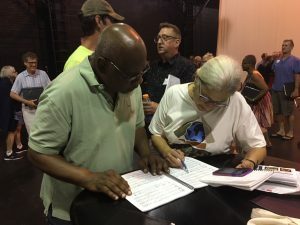 The 100-voice World House Choir will join singers from a variety of choirs and organizations in the Cincinnati tri-state area in four performances of Bayard Rustin: The Man Behind the Dream. Together let’s act to dismantle injustice. Let’s be a stick in the wheel. Please join us for one of the four performances of Bayard Rustin: The Man Behind the Dream. Admission is free [donations welcome].